The following is a review of The Royal Shakespeare Company’s production of Shakespeare’s Love’s Labour’s Lost from the Royal Shakespeare Theatre, Stratford-on-Avon, directed by Christopher Lushcombe, seen as a live cinema broadcast on February 11th, 2015. Love’s Labour’s Lost is an relatively early play, and not among Shakespeare’s best-known, but I find myself loving it and revisiting it far more often than many of Shakespeare’s better-known comedies, such as, say, Much Ado About Nothing or As You Like It. This could perhaps be something to do with the fact that this was the first play I ever saw at the Royal Shakespeare Theatre: the production I saw back then (nearly 37 years ago now) was directed by John Barton, and it seemed to me then and seems to me still – although I do realise that memory can play tricks on these matters – nothing short of perfection. However, I don’t want to turn into one of those boring old farts for whom nothing modern can ever match the glories of the past: at least, I don’t want to assume such a posture on all matters. For in the matter of theatrical productions of Shakespeare, the quality, to judge from the Henry IV plays I saw in Stratford-on-Avon last year, seems to be as high as it ever was. But it’s a difficult play to bring off, partly because Shakespeare more or less abandoned here the idea of plot, and also because so much of its effect depends on dizzying wordplay of a sort likely to lose a modern audience. Indeed, one can’t help wondering how much of this wordplay would have been picked up even by Shakespeare’s own audience: a line such as Berowne’s “Light seeking light doth light of light beguile” can yield multiple meanings when pondered at one’s leisure in one’s study, but delivered at the speed of sound in the theatre, it’s difficult to get little more than merely the sound of the words. MERCADE God save you, madam! PRINCESS Dead, for my life! MERCADE Even so; my tale is told. And that’s it. Within just a few seconds, the tonality changes beyond all recognition. The high spirits and the exuberance that we had all been enjoying till now gives way to more sombre hues; faced with the implacable fact of mortality, these characters now have to put away their childish things, and learn to grapple with sickness, with grief, and with the impermanence of life itself. I think it’s one of the most wonderful moments in all Shakespeare. But it is not a tragic ending. Paradise isn’t lost: it’s merely deferred. And when that paradise eventually comes, when Jack finally has Jill, both Jack and Jill may perhaps see the world in a more mature light; although, as Berowne sadly says, “that’s too long for a play”. BEROWNE To move wild laughter in the throat of death? I can never quite satisfy myself with mere analysis just what it is about these lines I find so moving. Is it perhaps a recognition of loss? – a loss of something that cannot be recovered? For, once one is aware of the complexities of life, of all its dark shadows and its miseries, what price mirth? What good is it, when it has no power to move a soul in agony? Where is gone all the unfettered joy and the exuberance? Are all these, too, childish things that must be put away? These questions aren’t answered: all that’s too long for a play, after all. This play comes to an end not with the characters becoming more mature, but with their realisation that, far from shutting themselves away from life, as they had planned to do at the opening of the play, they have now to engage with it. And, after all the linguistic virtuosity, the play ends with two very simple lyrics – homely songs, with everyday words, and images drawn from everyday life – such as maidens bleaching their summer smocks, or icicles hanging by the wall. We seem as far from the start of the play as it is possible to be: words are now used not for playing clever games, but for grappling with what is real. Grappling with all this in a performance, however, is a tall order, and I hope it isn’t seen as a backhanded compliment when I say this production nearly succeeds. It is the first of two related productions at the Royal Shakespeare Theatre this season – the second being Love’s Labour’s Won, a title one could search for in vain in Shakespeare’s Collected Works. It is known that a play with this title did indeed exist, but it is probably lost; or, conceivably, it could be the play we now know as Much Ado About Nothing. The Royal Shakespeare Company goes with the latter conjecture, and presents the two plays in tandem with much the same cast, and with Rosaline and Berowne transformed in the later play into Beatrice and Benedick. 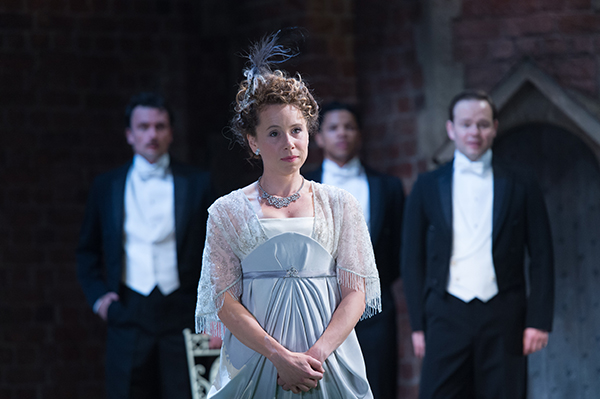 There is a further conceit in these productions: the two plays are both located in an English country house – the first before World War One, and the second after. I am not sure how this will work in Much Ado About Nothing (or Love’s Labour’s Won): that has not been broadcast in the cinemas yet; but I wasn’t, I admit, entirely convinced in Love’s Labour’s Lost. There is, after all, no mention in the text of any impending war, and the four men appearing at the end in military uniform seemed to me incongruous with the text of the play. And further, given what we know about the carnage that was WW1, it added a note of the tragic, which rather drowned out any sense of delicate and wistful melancholy. Of course, one could say that the delicate and wistful melancholy is but my own interpretation, and that other possible interpretations can also be valid. I don’t dispute that. But, having read through the play again after seeing this production, I could not at any point find anything to justify an interpretation that sees this ending as tragic. For why should it be? The men aren’t really going to war – there’s no mention of it; and neither are the marriages cancelled – they’re merely postponed. At the end, Berowne reflects that Jack hath not Jill, and, when reminded that Jack has not lost Jill for ever, comments “that’s too long for a play”. This comment is a bit sad, perhaps, and wistful, and half-humorous; but what it isn’t, I think, is tragic: Berowne’s disappointment – and it is no more than that – is not devoid of hope. However, in this production, it was delivered while holding back sobs, and I really can’t see any justification in the text for delivering it in this manner. The final songs as well, distinguished from the rest of the play by their extreme simplicity of diction, were performed here as a big musical number. It is all very well done, as indeed are all the other musical numbers. (This production, incidentally, is full of music, and it is all delightfully scored and performed.) But the simplicity which is the very essence of these final songs is missing. The play, whenever I read it, seems to have at the end a dying fall: here, instead, we are presented with a spectacular pageant. Perhaps I shouldn’t harp too much on the ending: I only do so because this particular ending seems to me among Shakespeare’s very finest, and the replacement of a gentle and wistful melancholy with full-throated spectacle did, frankly, leave me somewhat disappointed. Which is rather a pity, as the rest of the production could barely be improved upon. Although, even here, there are one or two things for a Beckmesser such as myself to carp about. Why, for instance, change Berowne’s “guerdon” to “emolument”? Sure, the modern audience is likely to be more familiar with the word “emolument”, but given that the joke is about Costard not understanding what the word means in the first place, perhaps “guerdon” should have been left untouched. Also, I couldn’t help wondering whether Michelle Terry’s Rosaline had to be quite so combative. Rosaline and Berowne clearly foreshadow Beatrice and Benedick in many respects, but even Beatrice and Benedick need to convince us that they do love each other, or, at least, that they come to love each other. Here, while Berowne is clearly besotted with Rosaline, I can’t say I had any great confidence that his love is reciprocated. At least, were I a young man (and I was once – honestly!) I wouldn’t have given much for my chances with this Rosaline. And finally, while I am still in my Beckmesser mode, there’s the pageant put on at the end by the curate, the schoolmaster, and others of the “lower orders”. In Shakespeare’s text, when Nathaniel the curate does his turn as Alexander, he speaks his few lines, Berowne has a few witticism at his expense, and then they all move on. Here, the scene was expanded: Nathaniel forgets his lines; Berowne makes a scathing comment; and, as Nathaniel is about to leave the stage in tears, one of the ladies (I think it was Rosaline) calls him back; and this time, Nathaniel remembers his lines, to much applause. Now, it is true that the ladies in this play educate the men, and that Berowne’s witticisms at the expense of the performers are uncalled for; but did the text really needed to be changed to underline this point so crudely? Far better, surely, is Shakespeare’s own way of making the point: in the text, at the height of the men’s barrage of “witticisms” (as in the similar scene at the end of A Midsummer Night’s Dream, it is the men, and not the ladies, who mock the admittedly absurd show on view), the schoolmaster Holofernes says: “This is not generous, not gentle, not humble.” It is a marvellous line. Holofernes had been, till this point, a preposterous comic figure, but with this single line he acquires a dignity and a humanity that the four noblemen at this point rather conspicuously lack. Sadly, this wonderful line was cut in this production, and this excision makes to me no sense at all. However, leaving aside the Beckmesserisms, there was much to admire. First of all, the sets: each scene was set in a different part of the country house – in the library, on the finely manicured lawn, the drawing room, the terrace, outside the front door, and at one point, quite unexpectedly, on the rooftop. The sets and the ingenious shifts of scene were wonderful: this must have been magical to have experienced in the theatre. And, while I may certainly quibble with certain aspects of the interpretation, the entire cast was marvellous, speaking the very difficult lines superbly, and, with impeccable comic timing, getting laughs where I wouldn’t have suspected any existed. The audience is unlikely to have followed all the arcane wordplay, but with performances of such fine comic zest, it didn’t seem to matter. In particular, John Hodgkinson as Don Armado played the “fantastical Spaniard” with an exuberant comic relish, delighting particularly in the smutty double entendres; while Edward Bennett as Berowne delivered his soaring paean to love in Act Four – surely among the very greatest of all love poems – with such clarity and ardour that time really did seem to stand still, and we, the audience, became, in Hamlet’s words, wonder-wounded hearers. Shakespeare may indeed, as I conjectured, have worried whether his mastery over language might be an escape from reality rather than an engagement with it; but when one comes across lines such as these, one feels that he really need not have worried. The sombre hues of the final scene may lift this play from a fine work to a great one; but even without these hues, what we have is exquisite. And it is so exquisitely presented that to carp on matters of interpretation, as I have been doing, is likely to appear merely churlish. Please note: a cinema broadcast of a theatrical event often makes an impact somewhat different from that when seen in the theatre. Do please see here for Sheila’s characteristically detailed account of the play as seen in the theatre: it really is the next best thing to actually being there. I don’t think I’m quite getting it, to be honest. I wasn’t expecting anything of the level of a Hamlet or a King Lear – that would have been foolish – but I was expecting something. So far, I have read two revenge tragedies, one from either end of the era during which the genre of the Revenge Tragedy was popular: The Spanish Tragedy, written when Shakespeare was still a young man and before his literary career had taken off; and now, the splendidly titled ‘Tis Pity She’s a Whore by John Ford, first performed in 1633 some seventeen years after Shakespeare’s death. But, different though these two plays are, what I am getting are no more than exciting stories, excitingly told, well crafted, and displaying a theatrical bravura: all well and good, one may say, but I am getting nothing so far of anything resembling a tragic vision. Are my expectations too high? Or is there really nothing more to these plays other than a finely tuned stagecraft? Should I just tune my expectations down to expecting no more than an exciting story? Perhaps. But I am not prepared to give up on this yet, by any means: I am particularly keen, amongst other things, to renew my acquaintance with John Webster. Maybe there is a tragic vision in there somewhere – but just not in the two plays I have read so far. In The Spanish Tragedy, much time was taken up between the crime and the revenge by Hieronimo going mad, and indulging in some quite splendid lunatic rants. Possibly that sort of thing was a bit out-of-date by Ford’s day: he fills in the time between set-up and pay-off by introducing various subsidiary characters and sub-plots, all quite ingeniously woven into the main fabric of the play. The characters are adroitly presented – from the villainous Donado to the imbecilic Bergetto, from the loyal but brutal servant Vasques to the passionate and vengeful Hippolita – and the various strands of the plot are presented with great clarity, so that they all complement each other rather than get in each other’s way. It would be unfair of me to give away the plot details: there was one especially that even I, who like to think of myself as cynical and jaded, had not expected. I must admit it gave me quite a jolt. And, even while reading this as I did on my commuter train, it’s hard not to feel a thrill of horror when Giovanni enters in the final scene with a still warm human heart skewered on his dagger. So what if it’s a rubber stage prop? By this stage you’re so involved in the story it doesn’t matter. So all in all, it’s tremendous fun. But where is the tragic vision I had been promised? I haven’t seen any so far, but I am but two plays into my project: let’s read on a bit more. Even if I do not end feeling exalted, I shall certainly be most royally entertained.